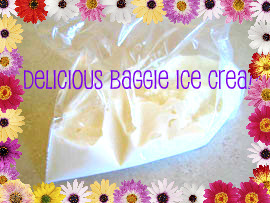 Kids will LOVE making baggie ice cream, it is delicious and easy to make! In the first sandwich sized plastic zip top bag place the milk, half and half, sugar and vanilla extract. Press air out and seal, place this bag in the second sandwich size bag and seal again. This prevents any salt getting into the ice cream. In the gallon sized bag add your ice and rock salt. Place your sandwich bag in the gallon sized bag and seal. Now have your kids put mitts, mittens or gloves on to protect their hand from getting too cold! Now it is time for the kids to shake and massage the bag, this takes about 15-20 minutes of movement. Put on some fun music to make the time go by, and everyone can dance while they prepare their ice cream! After 15-20 minutes remove sandwich bag from gallon sized bag and eat the ice cream straight out of the bag with a spoon of transfer to a bowl. YUM! Did you enjoy making baggie ice cream? Try more recipes here!